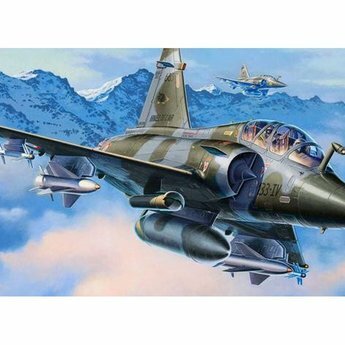 The multipurpose fighter Mirage 2000 is a result of the development of delta planes without a separate hydroplane. The interceptor can within the four-minute climb to 15 000 meters, he cites Mach 2. The D variant was developed in 1990 from the Mirage 2000N fighter-bomber and if equipped with conventional weaponry. Also available as model-set. Including paint (57, 65, 79, 99) + adhesive + brush.